We can only drink so much water. The days have gotten longer, the temperature a little warmer, and the shorts and sunglasses have come out. Summer has finally arrived. But as the days get warmer, staying hydrated becomes even more important. We have all heard the 8-glasses-of-water-per-day rule to stay hydrated, but during hot summer days even more water consumption is recommended. Although, let’s be honest, it’s already hard enough to drink that many glasses a day, (sorry, those beers don’t count) so relying purely on water for hydration can be a challenge. 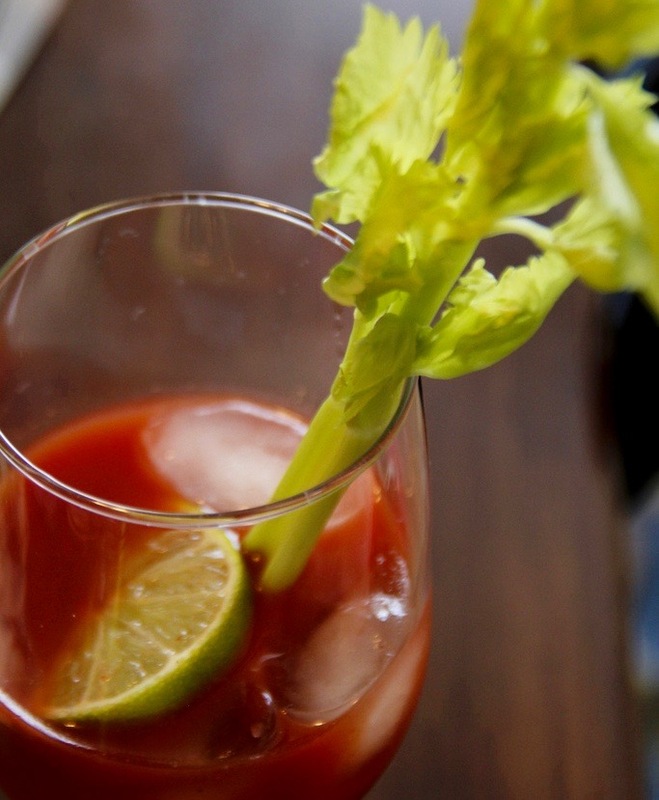 The good news is that there are other sources of liquid to help keep you hydrated such as juice, coffee, tea and food. In fact, food accounts for about 20% of our water intake. A study conducted at the University of Aberdeen in 2009 found that food may be more effective at hydrating your body than just drinking water. This is due to the micronutrients that are lost through sweat such as sodium, potassium, and certain vitamins. However, there are certain foods that are known for their higher water content and are therefore more effective at hydrating your body. As a general rule, most fruits and vegetables are your best bet for your sweat-inducing workout sessions or blazing hot days at the beach, so make sure to have lots of fresh produce on hand. Check out some of the most hydrating foods along with some ideas on how to incorporate them in your diet. Cucumbers are the food with the highest water content with a staggering 96.7% water. Cucumbers also have an abundance of micronutrients including Vitamins B1, B2, B3, B5, Folic Acid, Calcium, Vitamin C, Iron, Magnesium, Phosphorus, Potassium, and Zinc. 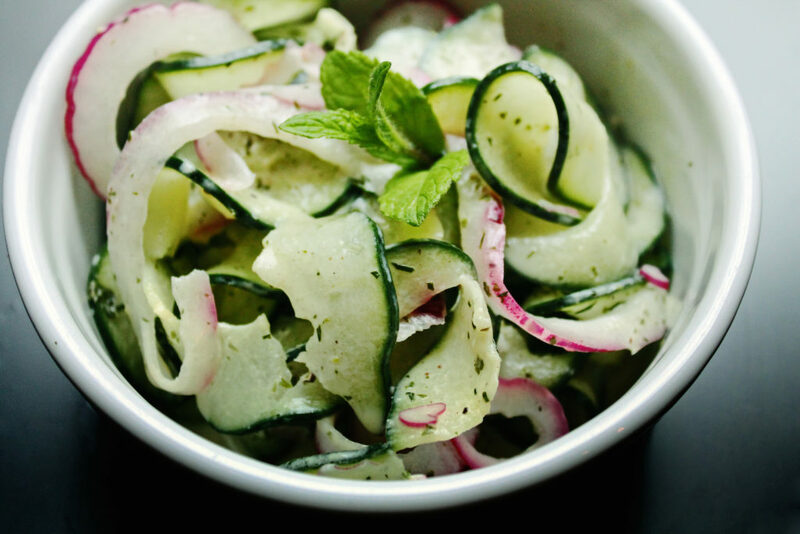 Try this delicious curly cucumber salad or a chilled cucumber soup for a refreshing and hydrating meal. With all the hype surrounding superfoods such as spinach and kale, iceberg lettuce is often overlooked. However, when it comes to staying hydrated, iceberg is unrivaled with a 95.6% water weight. 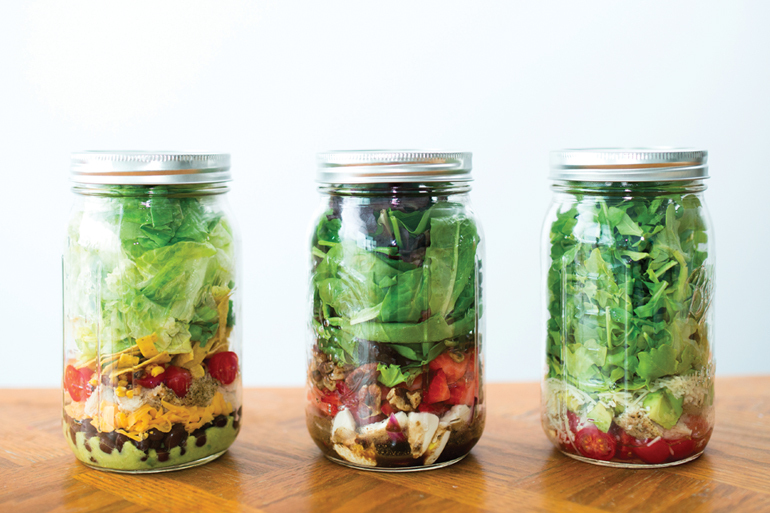 Iceberg lettuce is the perfect base for a mason jar salad on the go, but it doesn’t have to stop there – mix it up with some low-carb chicken lettuce wraps. Tomatoes – whether you consider them to be a fruit or a vegetable, they are full of nutritional benefits, one being their water content. Tomatoes also contain tons of carotenoids which are considered to have a role in reducing risk of disease. 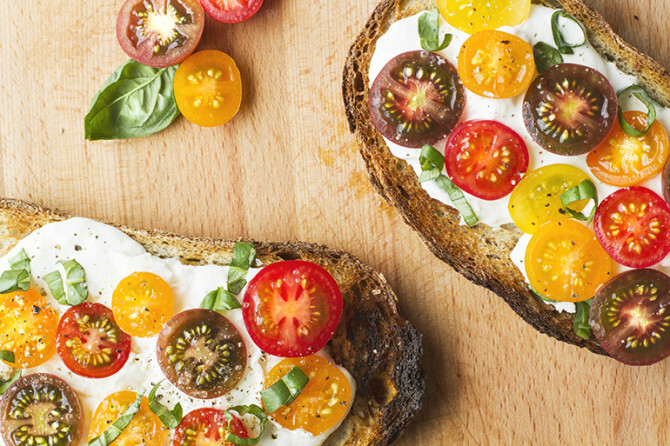 Of these, tomatoes are particularly high in the antioxidant lycopene, along with potassium and Vitamins A, E and C. Reap the nutritional benefits while staying hydrated with a bowl of fresh gazpacho, or a delicious Italian bruschetta. Green peppers are especially hydrating, with almost 94% water. Red, yellow and orange peppers contain about 92% water. 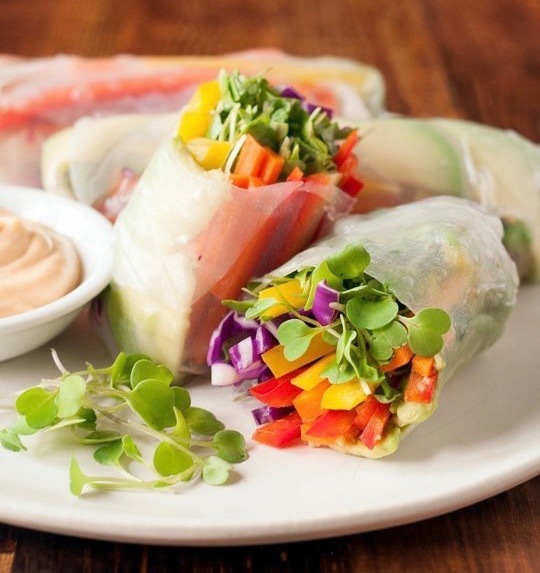 Peppers also boast an abundance of carotenoids and Vitamin C. The levels of these nutrients increase as the peppers ripen, so let them get nice and ripe and then throw a few slices of pepper into a few fresh Vietnamese spring rolls. Cauliflower is a cruciferous vegetable known to have high levels of glucosinolates, which have been associated with anticancer effects. Not only is cauliflower a functional food, but the vegetable contains over 92% water. 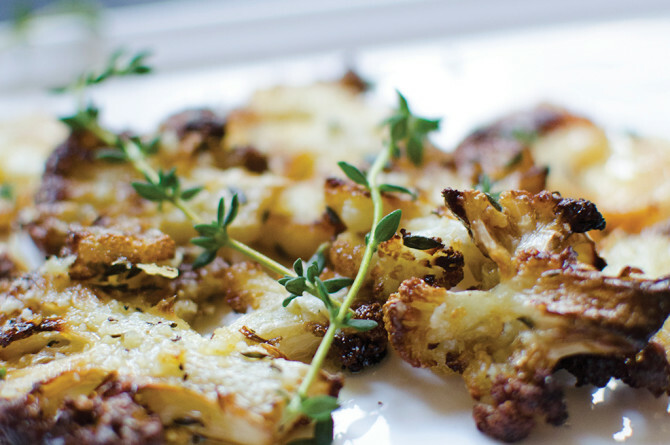 With BBQ season upon us, throw some slices on the grill for some delicious cauliflower steaks. Eggplants are not only high in fiber but very low in calories. They are a very hydrating vegetable, containing about 92% water. 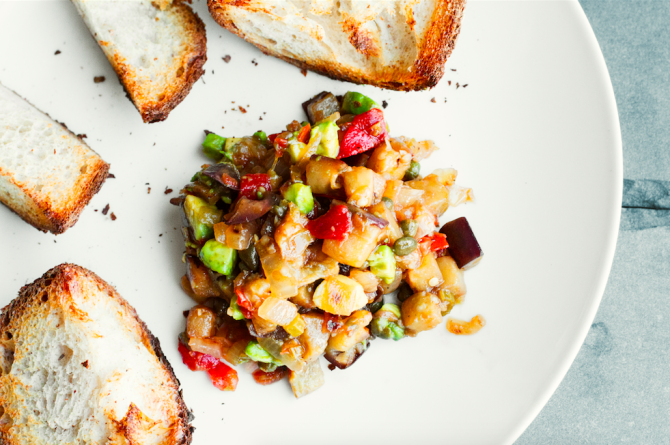 Skip the carbs and make this delicious eggplant pizza or go for the Italian twist with an eggplant caponata. Spinach, a superfood with a high water content, is the perfect summer food. It provides a very easy way to incorporate greens into a dish without overwhelming the taste. 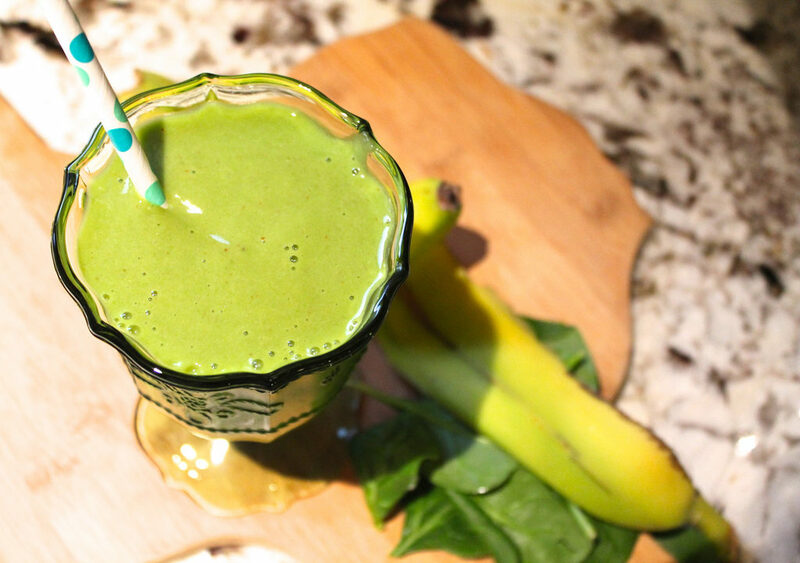 Throw some spinach in the blender with some fruit for a deliciously fresh and hydrating green smoothie. If you’re looking for lunch, try making a Caprese summer salad or some mouthwatering spinach artichoke quesadillas. 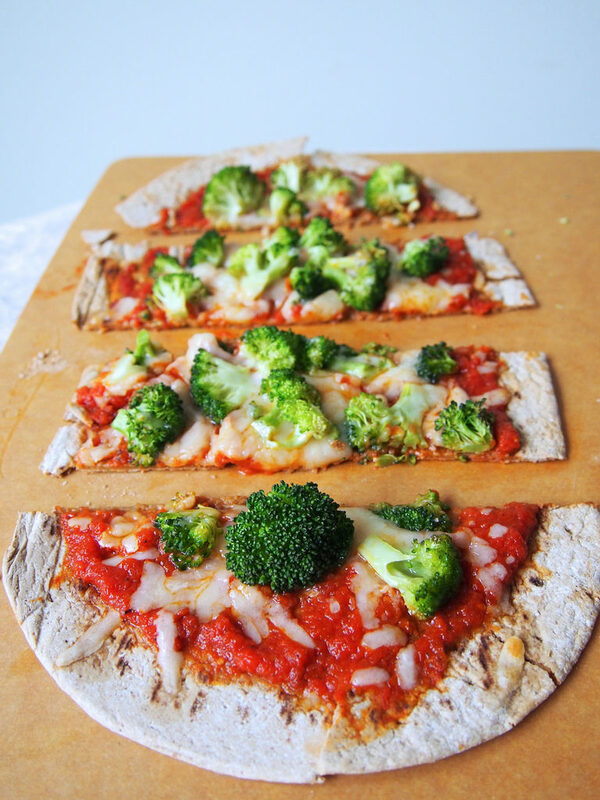 Broccoli may not look very hydrating but this cruciferous vegetable contains over 90% water, along with plenty of fiber, potassium, Vitamin A and Vitamin C. For a delicious summertime lunch, try a broccoli flatbread pizza or some broccoli quesadillas. 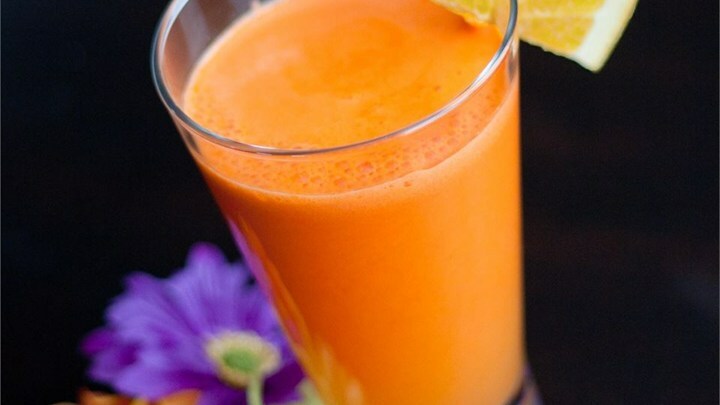 Carrots make for the best snack that doesn’t require cooking and give a satisfying crunch. They contain lots of Vitamin A, which may help improve vision. 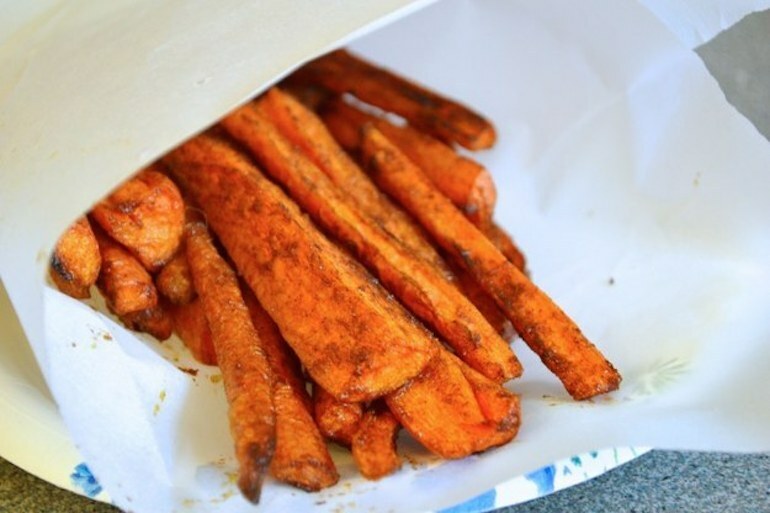 Alongside a nice salad or burger, opt for some carrot fries, which will outshine regular french fries and even the glorious sweet potato fries. The ultimate summer fruit. Watermelon contains high levels of the antioxidant lycopene, which has been linked to reduced risk for certain types of cancers. 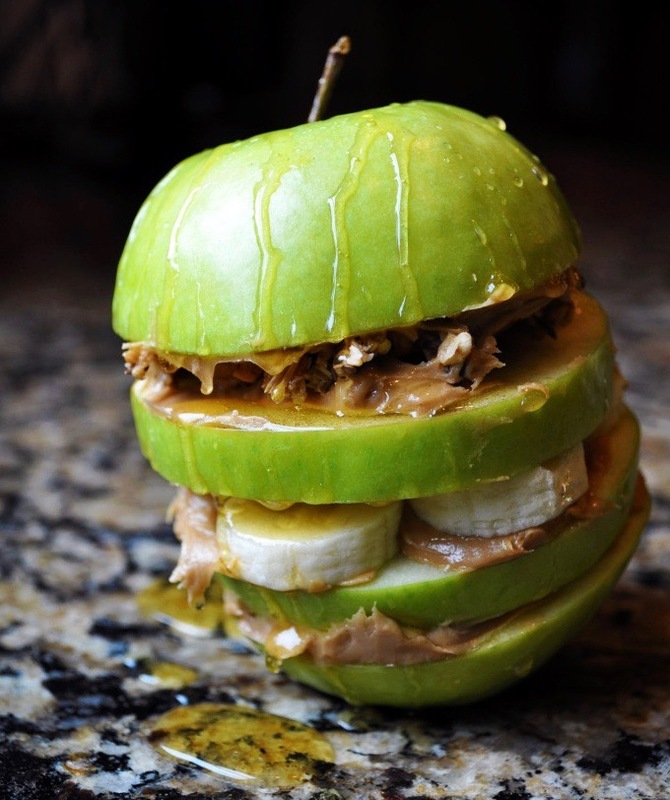 Looking for a fresh afternoon snack? Try a watermelon, feta and mint salad. 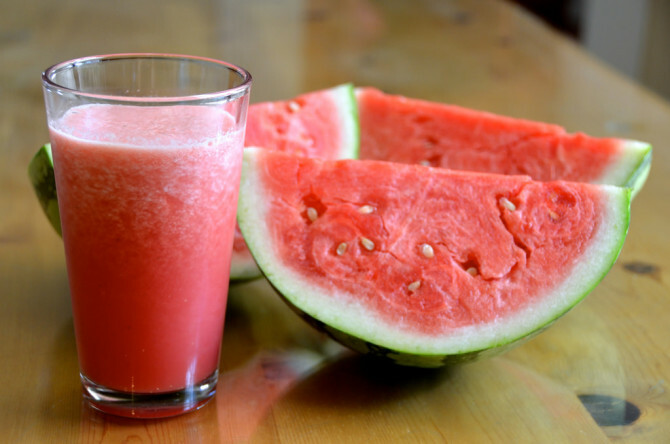 A watermelon smoothie will keep you hydrated by the pool, but if you’re looking for a little buzz, try tequila-soaked watermelon wedges or watermelon shots. Strawberries are rich in electrolytes, particularly potassium, which is lost through sweat. A cup of strawberries contains between five and ten percent of the daily recommended intake of liquid. 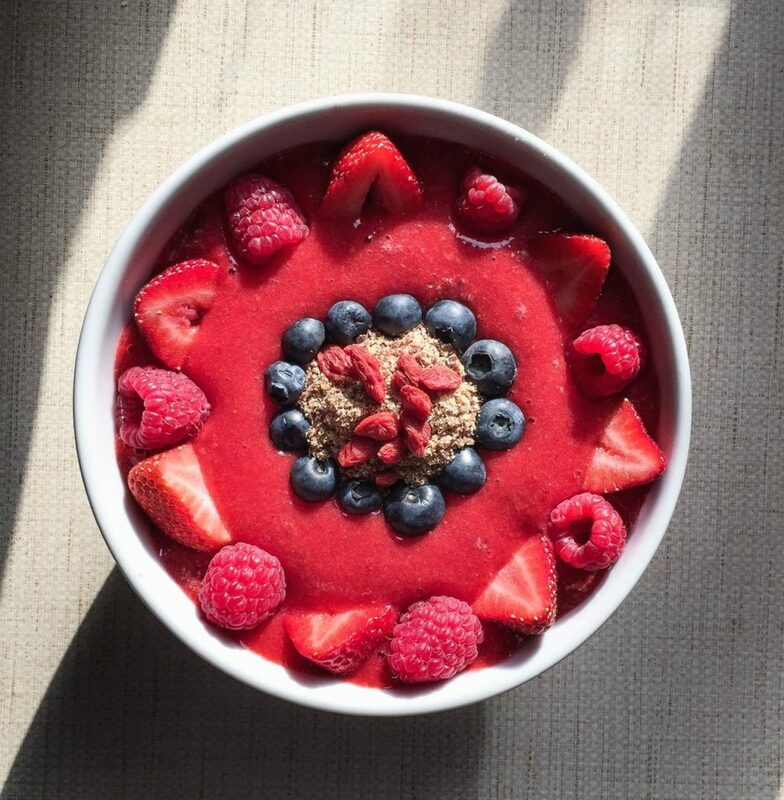 For a cool snack on a hot day, a strawberry smoothie bowl is the perfect fix. 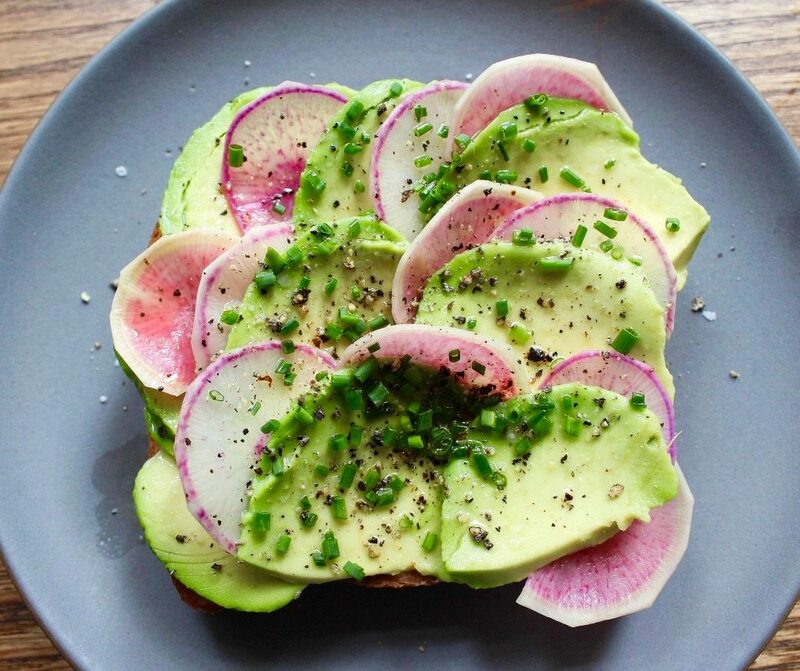 Looking for a light lunch? Try a delicious and low-calorie strawberry salad or grab some fresh veggies to combine with strawberry salsa or strawberry guacamole for the ultimate summer snack. This sweet and tangy fruit contains over 90% water and is full of Vitamins A and C, while being a very low-calorie food. 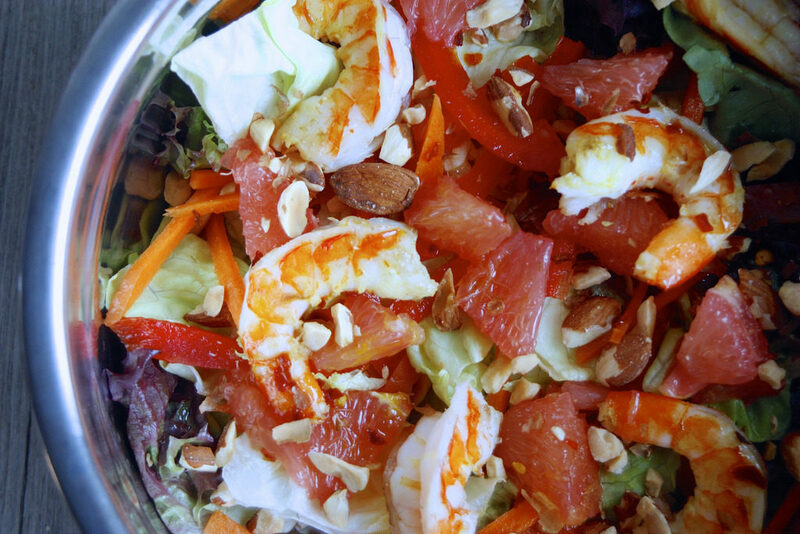 Prevent dehydration and enjoy a ruby red grapefruit and shrimp salad or fresh grapefruit-fish tacos. Cantaloupes are a staple food for summer afternoons and beach barbecues. Their mild flavor makes this fruit very easy to pair with any food. 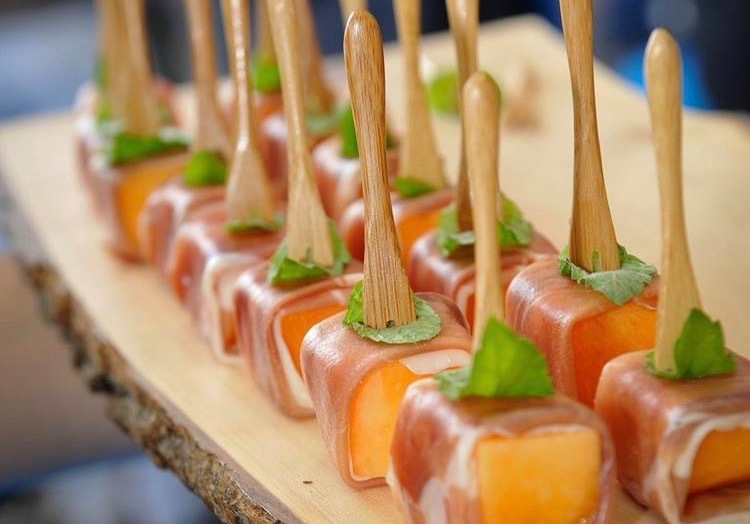 Try some cantaloupe wrapped in proscutto or slice it up with a scoop of cottage cheese for a healthy and hydrating snack. Pineapples are not only full of Vitamin C, they also contain high levels of bromelain, which aid in digestion. 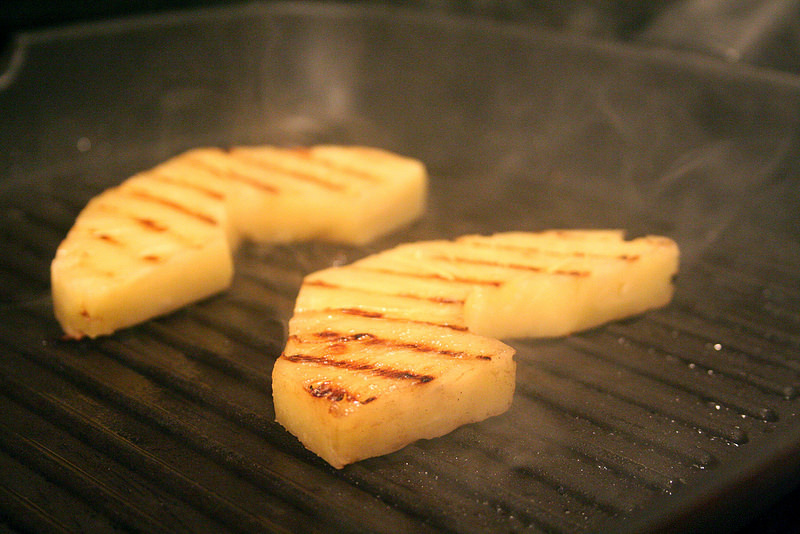 This tropical fruit is perfect on a hot summer day served fresh, or even better when grilled, making it soft and caramelized. Oranges contain over 87% water and eating just one orange will provide you with more than the daily recommended amount of Vitamin C. Squeeze some orange-carrot juice for a refreshing summer refreshment or make a delicious lettuce-less fennel and orange salad. Peaches, loaded with antioxidants, are in their peak season during the summer. Biting into a ripe, juicy peach from the farmers market will satisfy any sugar cravings as well as quench your thirst. 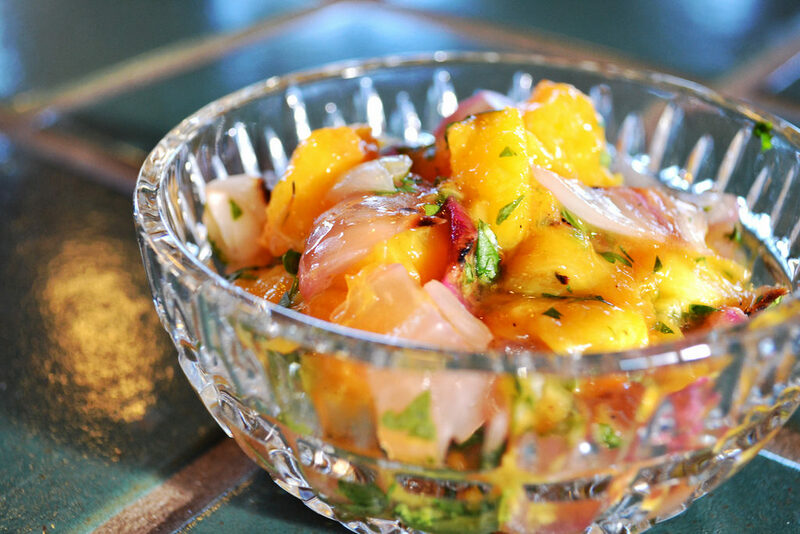 Try a grilled peach crostini with some peach salsa and chips for a delicious beachside lunch. If you’re in the mood for next-level food for the summer bbq’s, try making bacon wrapped peaches. Kiwis are abundant in Vitamin K, Vitamin E, and Vitamin C (20% more than oranges whaat?!) and of course, abundant in water. 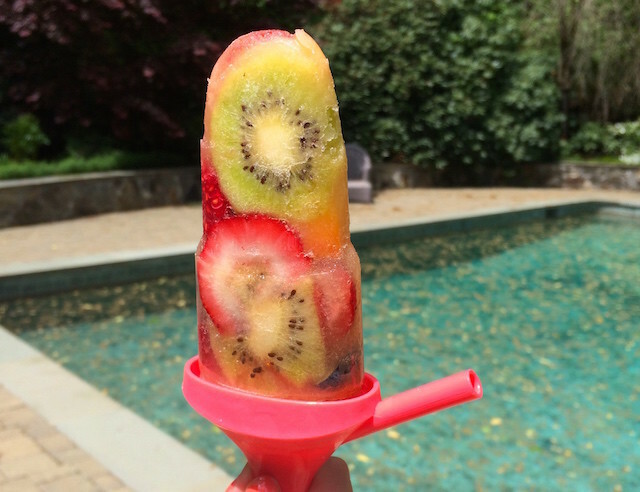 Slice a kiwi in half and spoon it out for an easy snack by the pool, or cut it into pieces with juice and freeze into fruit popsicles for a cooling snack while tanning. A soft, juicy pear is perfect on a hot summer day. 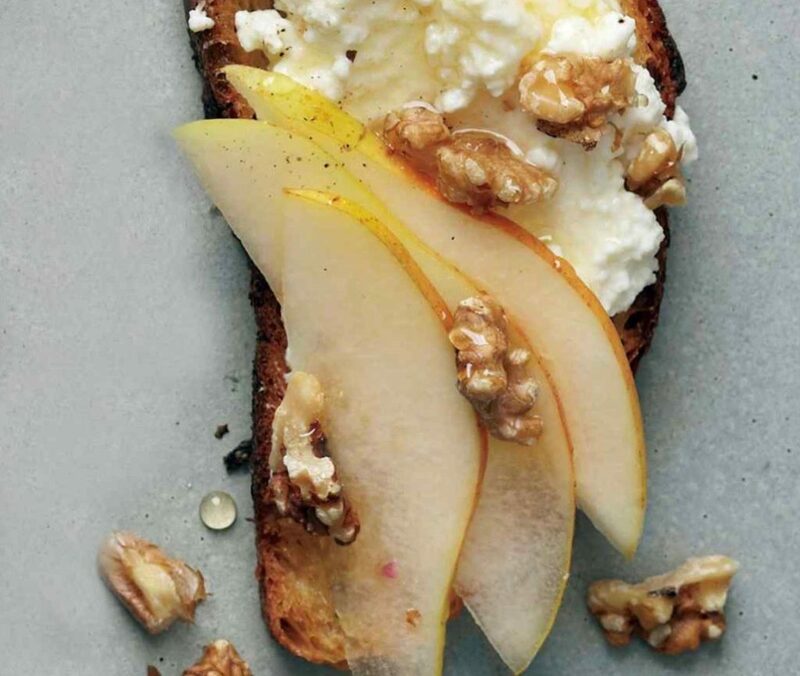 Packed with soluble fiber, vitamins and minerals, pears make for an ideal ingredient in any dish. Stay hydrated with delicious baked pears or combine pomegranate and pear for a sweet snack. Mangoes are a sweet treat for hot summer days. Mangoes contain a lot of fiber as well as Vitamins A, B6, and C. For a cooling snack, chop up some fresh mango or try making mango ice cream that requires just four ingredients. Looking for an evening dessert after a long day at the beach? 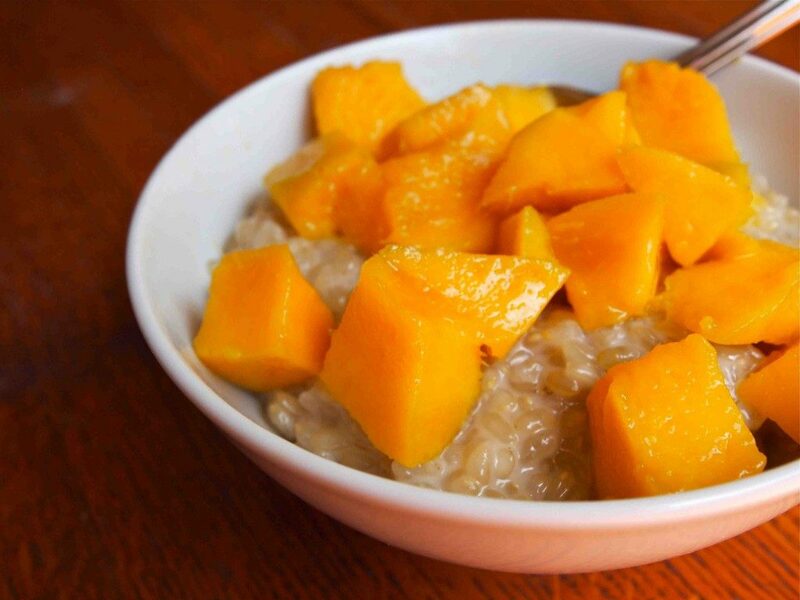 Coconut and mango sticky rice is the perfect treat.